My father-in-law was one of my favorite people in the whole world. He died last year, at 83 years old, from complications related to Alzheimer’s disease. It was painful to watch his bright, inquisitive and extremely humorous mind slip away. When he passed it was a blessing, and in many ways we all felt he had left us years before. I do not want to EVER experience this again. However, I know I probably will, we will live longer and face health issues the generations before us did not. My family, as well as John’s family is healthy. I expect we will all live well into our eighties, and like the women in my family, most likely into our nineties. However, this is not what scares me about Alzheimer’s disease. What panics me is the connection that has been established between down syndrome and Alzheimer’s disease. I have met and seen many adults with down syndrome in their forties and fifties who are showing signs of dementia. 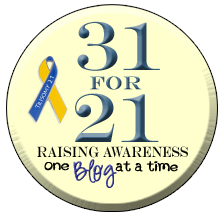 I now know adults with down syndrome are at risk for early-onset of Alzheimer’s disease. It is an established fact that persons with down syndrome have a greatly increased risk of early-onset Alzheimer’s Disease. 50-70% of people with down syndrome begin showing signs of dementia by the age of 60. There are also physiological similarities observed in the brain in persons with DS and persons with AD. By the age of 30-40, all persons with DS begin showing the same brain pathologies as seen in AD. What’s the cause of these connections? One heavily published area of research is the connection of Alzheimer’s Disease with a protein called Amyloid Precursor Protein (APP). This protein is a known risk factor for AD. It just so happens that this protein is encoded by a gene found on Human chromosome 21, the chromosome that is found in triplicate in the majority of persons with DS. It is likely that three copies of this gene in persons with DS significantly contribute to the increased frequency and earlier onset of dementia in people with DS. Another indication of the connection between DS and AD is that recently it has been demonstrated that triplicate copies(rather than the normal two copies) of a short segment of Chromosome 21 that contains APP has been shown to be associated with early onset of AD in people without DS. Recently, another protein has been identified from studies using cells from persons with DS. This protein causes cell damage similar to what is seen in persons with DS. 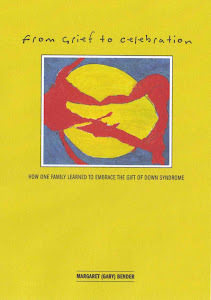 There is much more information on Research Down Syndrome's very informative website. I try not to dwell on the future too much. There is certainly enough to worry about in the present, but that does not mean I don’t worry abut Alex’s future. I wish for her to have all the opportunities every 16 year old has; independence, health and happiness. I want and need to stay on top of Alex’s health; present and future. I want and need to be involved in initiatives that affect Alex’s full potential. These remarkable programs include cognitive research as well as advances in Alzheimer’s research. An enormous thanks to those who are ahead of the curve, organizations like Research Down Syndrome, paving the way for our younger special children and teens. Alex’s future will be brighter and healthier than the generation before her, because of these efforts. All I need to do is figure out how to pay is forward. I have a grandson with down syndrome and worry about his future and his health. I also work in a hospital where I see people ruining their bodies with alcohol, drugs, smoking, and poor eating habits. My grandson may be at risk for early onset alzheimers, but he just might outlive some of the "typical" and "normal" people who choose to destroy their lives in other ways. We will continue to take the best care of him that we possibly can and love him to pieces.